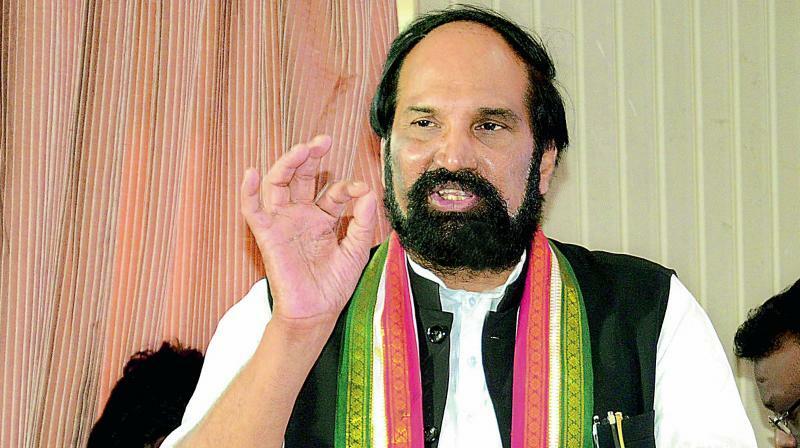 TPCC chief Uttam Kumar Reddy talks to Sriram Karri in an exclusive interview. He said, “The people of the state will throw KCR out of office six months early.” He said, one family has made the state their car-o-bar (karobar). We need a strong hand to write our destiny. Cycle is good for the environment. The joy in the hearts of the people will know no bounds on December 7, because an oppressed people, who have unfairly suffered a regime that betrayed their every dream and aspiration during its four-and-a-half year rule, will find deliverance on Friday, said Capt Uttam Kumar Reddy, TPCC president, a few days ago. Excerpts from an interview with Uttam Kumar Reddy conducted before the end of the campaign. Q The campaign will end in a few days. You have travelled across the state addressing meetings in constituencies across all districts. How do you read the mood of the people? The people of State hate those who betray them, cheat them and lie to them. State has always punished those who have challenged their dignity, hurt their sentiments and behaved disrespectfully towards them. Now look at KCR and his government. He never respected the office of chief minister the people gave him. He never went to the Secretariat. Our people are inherently democratically inclined. KCR hates being questioned and criticised, and abuses and crushes those who question him. Be it Dalits, who questioned the sand mafia in the chief minister’s son’s constituency and across the state and were illegally arrested and tortured, or be it farmers who asked for a fair price for their produce who were handcuffed and caned. Be it the tribals and Muslims who asked him about the 12 per cent reservations. Be it the mothers of martyrs who asked him about Dharna Chowk. Be it the opposition or media. Be it the educated youth who asked him about jobs. What happened to the promises? Not one of them has been fulfilled. KCR has no right to ask for votes, he must apologise to the people. But since he is in denial, people will teach him a lesson on the coming Friday. Has not the Congress tried to focus too much on welfare in this election in its manifesto and its campaign? What about growth and the economy? A. The people of State fought for a separate state because of the belief that we are as a state blessed with water, revenue, and opportunity. Our people are ingenious, hardworking and capable. The only reason we do not have great social equity and welfare is misrule. It is a very fair expression of what people want that we have promised. The manifesto of the Congress did not come from some academic exercise. In the last few years, whenever we met people we asked them about their problems and what they would like. We have promised essentially that farmers must be saved from excruciating burden of debt and be given fair prices for their produce, that youth must be given jobs, and till we find a job for everyone, an unemployment allowance should be paid. Pensions for people must be for every individual, not one per family, it must start at 58 years, not 65 years, and it must be doubled. We speak of education and healthcare, which while being welfare on the one hand, will also create a huge number of jobs. We want to give a house to everyone by giving them financial investment to build it for themselves. Finally, our promises are very responsible and if KCR has not been led by the one desire to loot the state and hand over the keys of the exchequer to his family, our people would have had all these by now. Q There are apprehensions about people of Andhra origin taking control of the destiny of State because you have partnered with Chandrababu Naidu of the TD. The shameless crooked mindset and twisted logic of the State Rashtra Samithi is exposed in this kind of allegation. Will the Congress party, which did not think about 25 Lok Sabha and 175 Assembly seats in Andhra Pradesh before creating a separate State, compromise on the interests of our state and people? If Congress cared to gain in Andhra at the cost of State, would KCR have become a chief minister? No one can control the destiny of State except its own people, and those they elected. Q There has been little focus on Hyderabad during the campaign. As if the urban voters do not matter at all. A. I ask you a question: Let everyone in Hyderabad think about this for one minute before going to vote - look around and answer. The beautiful Tank Bund and Necklace Road, the Buddha Statue, Hitech City, Financial District, all the global companies and jobs, the IT and Pharma cities, Airport, Ring Road, IIIT, ISB, NALSAR, Metro rail, MMTS — all these were created either by the Congress or our partner, the TD. What has TRS done? I am sure the city of Hyderabad will give the pink slip to the pink party. Q Everybody loves to have a car. (Laughing) Totally be-car (bekar). One family has made the state their car-o-bar (karobar). We need a strong hand to write our destiny. Cycle is good for the environment. Q How many seats do you think you will win? Don’t want to predict seats; it is the job of psephologists. But I am sure we will get between 75 to 85 seats. The TRS will not even get 35.